BobbiToads are definitely unique. I have never seen another shoe like these. The best part is that they allow your daughter’s imagination to run wild. My daughter has always loved putting on nail polish on her toes. We’ve been doing it together since she was very little. Recently, she has started to paint her own nails. So when she saw these shoes she could paint herself, she was in love. We looked at all the adorable styles on the website. 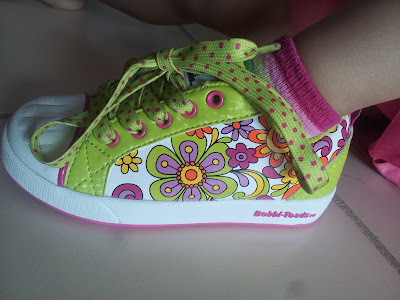 My personal favorite was the BobbiToads signature styles, the frog pattern on the Rhonda Kaze style, but my daughter decided on the Holly Rae. I just love the fun names of the shoes. There are some styles that come with velcro, for younger girls, and some styles that have laces. My daughter is about to turn 5, and she informed me that she was getting lace up shoes since she’s a big girl. You can purchase the shoes for $49.95. Ashlynn was over the moon when the package arrived in the mail. 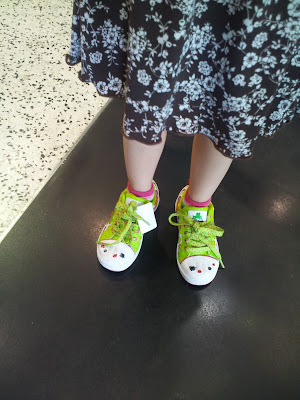 The shoes were super colorful, which Ashlynn loves. They are covered in fluorescent flowers. The toe of the shoe is white, and has the outline of the five toes with ‘nails’ for your daughter to paint. 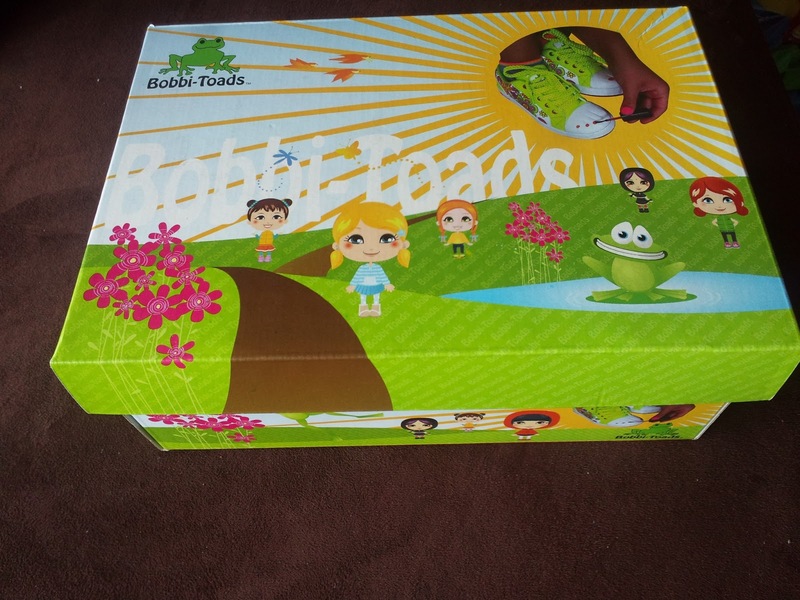 BobbiToads sells nail polish separately, that you can use to paint your shoes. The coordinating colors have super cute names like Bubble Gum and Cotton Candy. Each nail polish is $7.99. You can also purchase the BobbiToads nail polish remover for $7.99. Bobbi-Polish is non-toxic and girls can also use it to paint their own fingernails to match. We used our own nail polish from home. My daughter likes to different colors on different toes and make patterns. I asked her if she wanted me to help her paint them, but of course she wanted to do it all on her own. She couldn’t wait to wear them. My daughter was excited to learn that she can remove the nail polish and paint them a different color, again and again. She was disappointed that the white toes were starting to get scuffed after her first day wearing her new shoes out and about. Today was her second day wearing the shoes, her first day wearing them at school. I made sure to tie the laces extra tight for school, because yesterday they kept coming undone even though I had double knotted them, and Ashlynn is still working on learning to tie her own laces, so I didn’t want the teacher to be stuck tying them. When she came home today she asked me if I could buy two more pairs of BobbiToads because her best buddies at school, twin sisters, want some too! She was sad that the nail polish was already starting to come off after only the second day wearing them, but I assured her that we could paint them again as often as she likes. 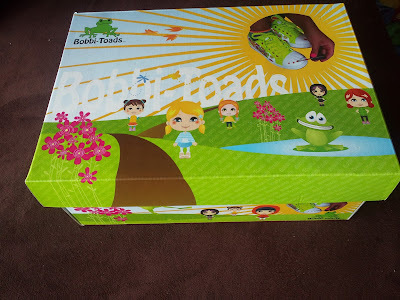 My daughter thinks her new BobbiToads are very comfortable, and she likes that she receives compliments on them so often, because they’re so unique and because they are so bright and eye catching. I would recommend them for any girl who enjoys putting on nail polish, or for a girl who likes arts and crafts projects. Buy It: You can purchase the Hollie Rae for $49.95. Make sure to connect with Bobbi-Toads on Facebook and Twitter! ive never heard of these! how cool! im lovin that you can paint your nails to match! super cool! these are really cute but i think a lil too pricey lol but i know a girl who would love it! I love Bobbi-Toads! Aren't they just the cutest shoes you ever saw! 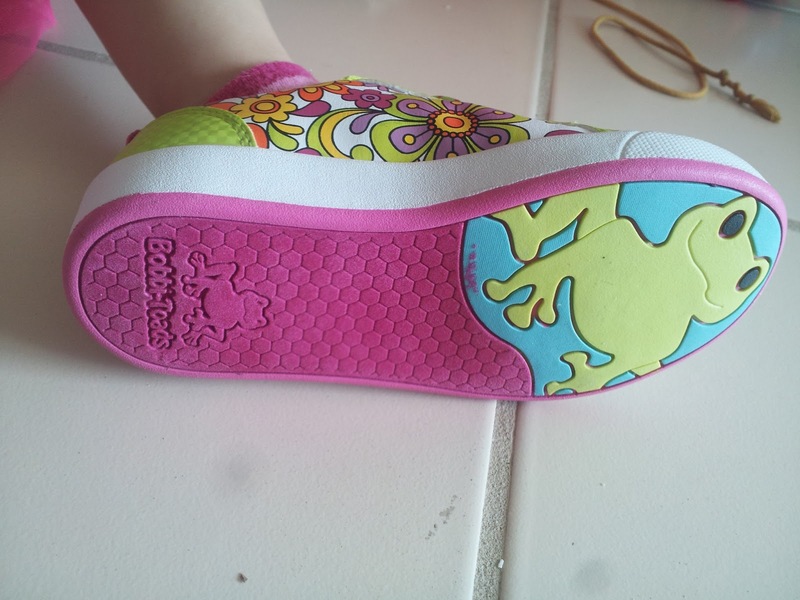 My granddaughters all flipped over these. Thanks for sharing. love that they use non toxic polish! what a great idea to spike creativity ! What cute shoes! The frog on the bottom is adorable! These are so cute if I had a little girl I would get her a pair. These are so cute and I love that you can pain the nails.